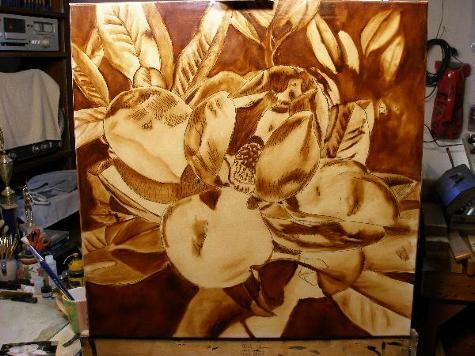 How to oil paint a magnolia blossom using the flemish technique. How to oil paint the Magnolia blossom. A southern favorite in flemish style! 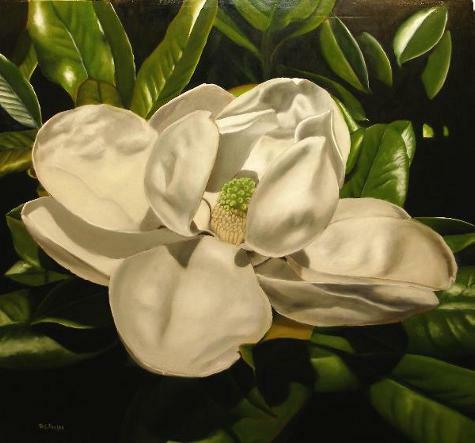 Home > oil painting for beginners tips > How to oil paint a magnolia blossom. 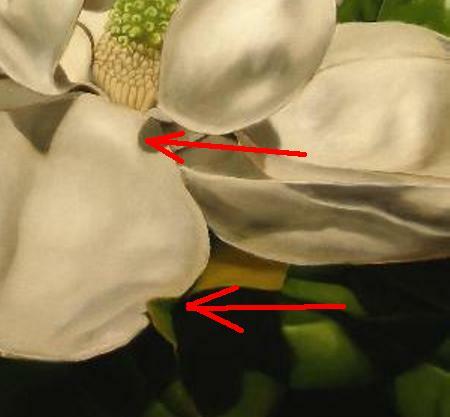 How to oil paint this magnolia blossom, and utilize a new oil painting technique not discussed elsewhere in the site. We follow our normal procedure of transferring the drawing onto the canvas, tracing over the drawing with a water proof ink, and then toning the canvas with the imprimatura. This beautiful example of the magnolia was found during a motorcycle trip my cousin and I took just when these fellows were at their peak! Living in a town that has hundreds of these trees, it's not difficult to find one that is superb. It made for a great riding trip with the cool morning breeze, wonderful scents from the blossoms, and taking in the splendor of this magnificent tree. 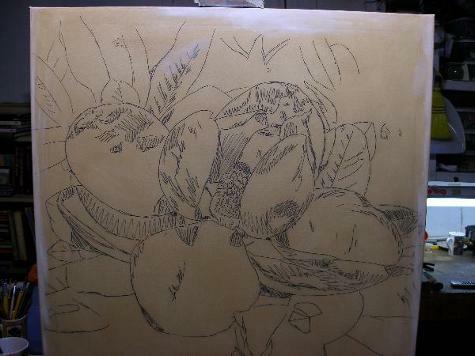 Here's our toned canvas with it's drawing inked in. 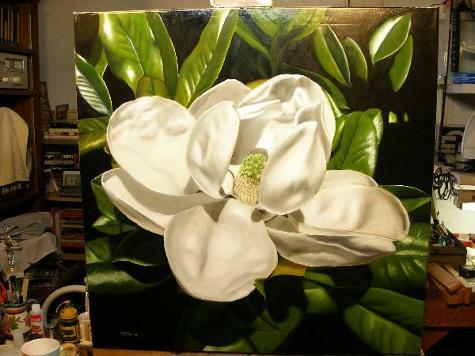 How to oil paint a magnolia, first steps. And our Umber under painting. This is a little loose, in that very few details are included. Just getting a handle on the over all tonality of the piece, and establishing the darkest shadow areas. 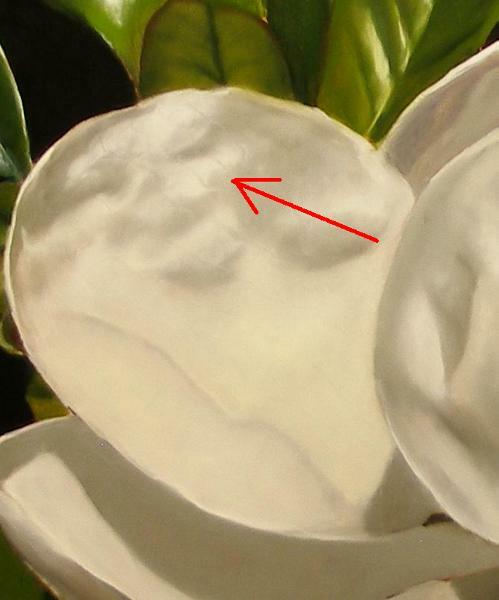 In this how to oil paint a magnolia demonstration, realize too that it is a white painting. How to make that blossom glow? Surround it with darks! The contrast will fake out the eye. Now in this next part, we have lots of fun! We establish the very subtle nuances of white shading within the blossom itself. All the little folds, and variations of lights to darks in the half shadows. We also establish the backgrounds darkest darks and a middle gray for the leaves. Remember, no fine details or texture is attempted. Just the main folds, ripples and shadow play. Now we get to the color layers, and the finishing layers. The leaves get all the work! This photo shows the finished piece on the easel. The color layers concentrated on the leaves and center of the blossom. The petals were mostly done already. 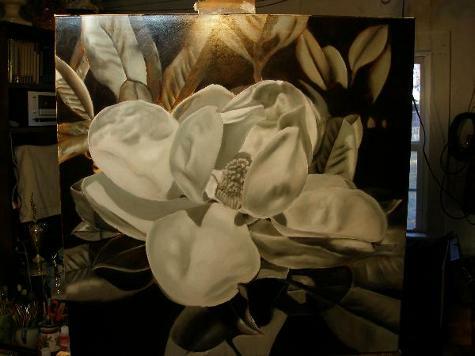 How to oil paint a magnolia flower, a few more details in the final approach. A few things to point out here. On the upper arrow, this particular bulge or fold of the petal is accentuated with a bit of cadmium yellow light added to the white to simulate sunlight striking the petal. It is exaggerated as well as other folds to give the blossom more interest. The lower arrow point to an exaggeration of a leaf overhanging the petal. Again, it is a small point of interest that keeps the viewers eye revolving within the blossom. (Above) In this close up I want to tell you about a technique I tried in order to achieve this effect! You see, I learn new stuff on how to oil paint as often as I can, sometimes its a re-discovery, sometimes its a completely new idea and technique. Once the gray layer was dried, during the color layer application, I used this technique. Applying paint to the highlighted area of the petal, I wanted to simulate the intricate veins that are found throughout the flower. This is a scratching technique. Using the back handle of the paint brush, I scratched out the veins on the petal. The scratching revealed the darker shadow grey layer underneath. It gave a very distinct line that had paint built up on both sides of the gouge mark. When using the mop blending brush in the direction against the sunlight, it pulled the paint in the direction of the light and made a very believable tiny vein. Some areas I came back with a highlight, or a shadow to deepen the illusion. The completed work was accepted by the client! Which means, I gotta go out for another motorbike ride and get a few more reference photo's before these babies dry up to the little hand grenades we used to imagine them for when I was a youngling. Yes, the blossoms do dry up and fall off. But when you paint one, it will live in your house, and your heart forever! If you've enjoyed this article, why not share it on Facebook, Google +, or Pin it! Other's will thank you for it! 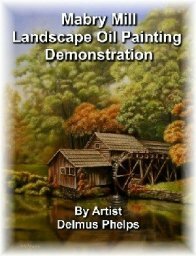 Did you learn anything about how to oil paint in this lesson? Drop me a line or post your own work here at your oil paintings! Or even check out some of our readers paintings! They will utterly amaze you, some of them are just that good.